If you live locally or outside of the area and desire to serve the ranch as a group, we invite you to complete and return our Group Volunteer Application. As the ranch grows, so does our list of chores! 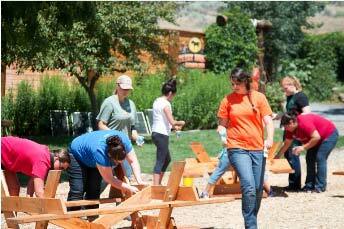 We often have groups inquire about volunteering at Crystal Peaks. While those groups can be very helpful, our staff’s primary focus is on our sessions ministry, and so we must limit the number of groups we are able to accept. When filling the Group Volunteer Application, be sure to include group dynamics (number of people, approximate age group, leader-to-kid ratio if it is youth, etc.) and any specific skills or talents your group wishes to utilize or share. Those skills can range from basic ranch chores to scooping manure to playing with kids. 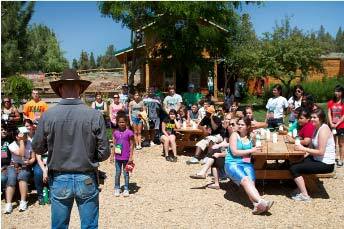 Whatever the nature of your group, we hope to find a good fit for you that will also meet a need at the ranch! Application must be submitted 2+ months ​before desired volunteer date. Both a group application and an interview with the group leader are required. Each participant must complete a current Ranch Release form. 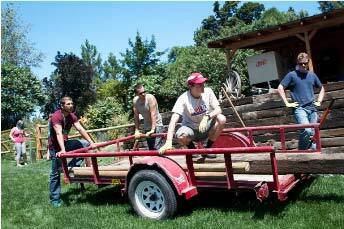 Local Group Volunteers must be scheduled during our regular work week (Monday-Thursday, 9:00 a.m. - 5:30 p.m.). Please check the Calendar of Events for Ranch closures. Local Groups do have the option of being "On Call," and we will contact you when we have big jobs arise that will require many hands or specific skills. We welcome groups of kids and teens as well! However, we do require a ratio of 1 of your own leaders to every 5 kids/teens that you bring.